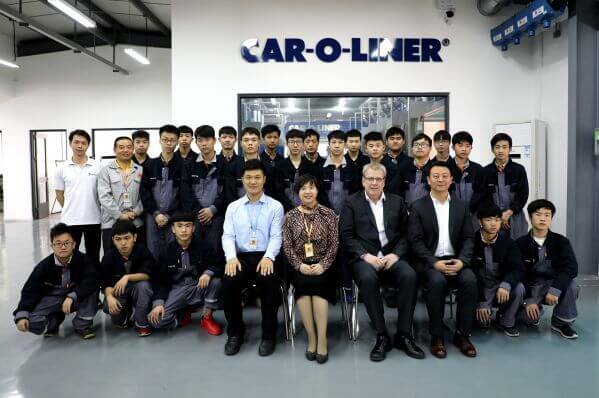 Car-O-Liner Academy recently accepted the Best Partner Company award at the 3rd Guangzhou Vocational Education Jinrui competition which is sponsored by the Guangzhou Municipal Bureau of Education. It is a symbol that the Guangzhou Education Bureau has commended Car-O-Liner Academy for its excellent innovation and great contribution to school-enterprise cooperation, and indicates that Car-O-Liner Academy will continue to enhance Guangzhou vocational education in the future. This Guangzhou Vocational Education Jinrui Award was awarded to the city’s vocational technical college and technical schools for their outstanding teachers and students, and excellent companies in school-enterprise cooperation by the Guangzhou Municipal Bureau of Education, the Guangzhou Municipal Bureau of Human Resources and Social Security, and the Guangzhou Vocational and Technical Education Society during the “Guangzhou 2018 Vocational Education Activity Week”. This event widely promotes the development and transformation of vocational education in Guangzhou, to fully demonstrate the achievements of highly qualified education, and to promote the development of vocational education. This selection includes six awards: “Most Promising Professional”, “Future Craftsman Star”, “World Skills Rookie”, “Gold Medal Mentor”, “Best Lead College” and “Best Cooperative Enterprise”. The last one is to commend the companies which have made outstanding contributions to the development of Guangzhou vocational education by means of the school-enterprise cooperation project. BMW(China), Guangzhou Automobile Honda, and FAW Toyota have also won this award.